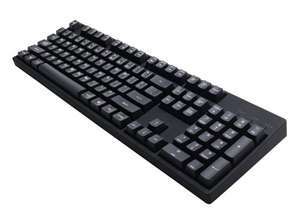 Extremely good deal on solid mechanical keyboard, usually this keyboard goes for £50-70. Shipping from Germany is around £4.5. CM Storm is proud to introduce the Quickfire XT, a full 104 key sibling to the top-rated QuickFire Rapid. Exhibiting the same extremely solid construction did won the hearts of QuickFire Rapid owners, the Quickfire XT utilizes top-rated Cherry MX mechanical switches available in various switch types to give a more unique and customized typing experience. Featuring a smooth and clean aesthetic, ultra-slim body design, and adjustable repeat rates, the Quickfire XT therefore includes laser-marked KeyCaps and a non-glossy matte finish. This total package is complemented by a set of specially KeyCaps (including a key puller) That Give the keyboard, and its user, a bit of individuality That Provides a striking outlook. PS: This is my first post. What is the difference between this and the good old Microsoft that I have been using for years? Good price if you don't mind that it's NOT UK layout. Seems to be worth a punt, ordered one. Thanks kurima2. What is the difference between this and the good old Microsoft that I … What is the difference between this and the good old Microsoft that I have been using for years? Mechanical keyboards have become more popular recently for gaming because of the tactile feeling you get when using them. There is a true click, and a loud one at that. There are different levels of click and noise which are determined by 'Cherry Red' or 'Brown' if you do a quick google it'll soon tell you the nuances. Some love mechanical others don't I believe they were a typists dream back in the day when moving from typewriters to a keyboard. whats the main difference in layout? Cheers, OOS but I've ordered in case it comes back in stock. The @ and " are switched as well as the # being on the number 3. Also you get a single row sized enter key, not the almost square one found on UK layouts. You get a bigger left shift key as the backslash is pushed above the now smaller enter key. The @ and " are switched as well as the # being on the number 3. Also you … The @ and " are switched as well as the # being on the number 3. Also you get a single row sized enter key, not the almost square one found on UK layouts. You get a bigger left shift key as the backslash is pushed above the now smaller enter key.I think that's about it. I assume you can change the keyboard to UK layout in Windows though and pull the keycaps and swap them over? Z & Y are in the QWERTY place as its ANSI / USA layout not German QWERTZ layout. I ordered one. Never used a foreign Amazon site but hopefully it will all come good. As for US layout, it's not going to bother me when playing games and that is what I'll use the k/b for. Anyway, ta OP, heat added. I assume you can change the keyboard to UK layout in Windows though and … I assume you can change the keyboard to UK layout in Windows though and pull the keycaps and swap them over? I was thinking the same if it is possible this deal is even better heat added either way. No way could I go back to a membrane now I wouldn't think. edit: comes with a set of extra caps and key puller. Wish Amazon would sort out their crap rule that you can't order in GBP when not in stock. Showing the price above here. Have ordered. This is a cracking deal if they let them through. The price in the title is misleading without postage. I'm using gaming.coolermaster.com/en/…tk/ brown with white led. The one on offer here will do nicely for the difference in money though. No the physical layout is different, no backslach "\" next to Z and different shape "Enter" key. This can never be made to be a UK keyboard (EVER!). It clearly says its US layout in description and even model number is uk one. I'm using … I'm using http://gaming.coolermaster.com/en/products/keyboards/quickfiretk/ brown with white led.The one on offer here will do nicely for the difference in money though. Doesnt deliver to my address in ireland, too bad. Its also out of stock. The price with P&P comes to around £23.71 (€33.54 - €27.28 + €6.26 P&P), which is still pretty cheap for a mechanical keyboard. You can't "convert" the physical layout, as the switches are in different places. You can set it to a UK keyboard though and not have shift + 2 as the @ sign, and have it revert to 'normal', even though the key won't show the @ symbol. You can create custom keyboard layouts if you really want with free software. The only one I've ever wanted to change though was the @ key. No the physical layout is different, no backslach "\" next to Z and … No the physical layout is different, no backslach "\" next to Z and different shape "Enter" key. This can never be made to be a UK keyboard (EVER!). I think I can cope with US layout... for the price it's worth a shot. Worth a shot for the price it is, thanks! Yes that does indeed suggest it is a UK keyboard. Will wait and see! That would be awesome, but I'm suspecting a bit more that this is a product ID mismatch now you've pointed that out. HOT...... looks like a misprice, selling for £84.99 on Amazon UK. Ordered on the off chance it may be delivered. If you've never used a mechanical keyboard, this is the time to bite. Looking cheap & reliable brown for a while, nice find. Ordered 3. Mechanical keyboards have become more popular recently for gaming because … Mechanical keyboards have become more popular recently for gaming because of the tactile feeling you get when using them. There is a true click, and a loud one at that. There are different levels of click and noise which are determined by 'Cherry Red' or 'Brown' if you do a quick google it'll soon tell you the nuances.Some love mechanical others don't I believe they were a typists dream back in the day when moving from typewriters to a keyboard. It's funny because console controllers don't have a click. Deal posting newbie! This is kurima2 first deal post. Help out by leaving a posting tip or just to show your appreciation for their contribution.